"The monkey trail is named after the monkey (macaca fascicularis) that are often seen in the karst. The trail consists of a total of 355 wooden steps and 386 hardened and paved steps. In 15 days, 100 men built the steps, starting from the top and working their way down be segment. 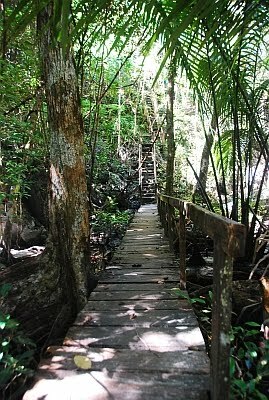 The original jungle trail was made of timber salvaged from the park. Hence, it was easier to start at the top and bring the logs down rather than haul them uphill." said the billboard displayed at the entrance of the Puerto Princesa Subterranean River National Park in Palawan. 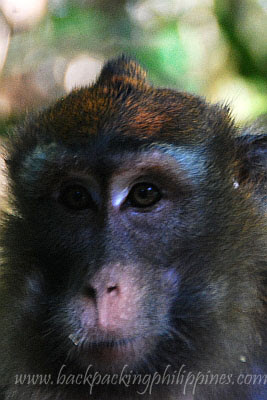 What can you see on the monkey trail? 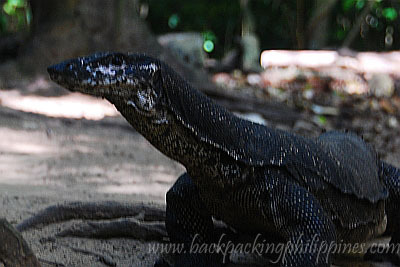 Monkeys, the only species of monkeys in the Philippines locally known as tsonggo and bayawak (monitor lizards) roaming around. Expect also pythons, plants and animals better left in the wild rather than caged in zoos. Note when you see wildlife, don't feed them as it alters their eating habits and endears them to humans making them less wild and lowers survival instincts. This jungle trail in Palawan reminded Tutubi of the beautifully preserved Blue Mountain National Park in Australia that he was able to visit (and yet forgot to post on this blog), where you can see endemic species of flora and fauna and where trees and plants have signs with common names, scientific names and their important role in the ecosystems, including swamps that appear ordinary and must-avoid but actually goldmine for scientists. as you need to start early, suggest you go to Sabang the day before you intend to do the trek then spend night at some accommodations on Sabang Beach. It's present on OpenStreetMap, you can browse it online and/or use a GPS navigator to track your location. Please also carry all your trash back with you to Sabang for proper disposal and not litter the trail (if not, you're one of the "backpackers" DOT Sec. Alberto Lim who "leaves waste" giving good backpackers a bad name). 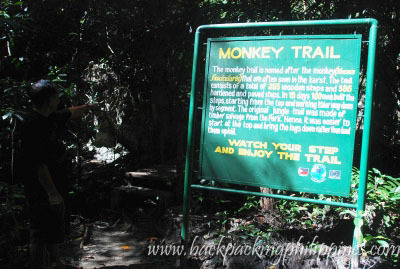 Tutubi would love to re-visit Palawan someday, one of his favorite destinations, and intends to do this monkey trail next time around. Great blog! I would love to see those beautiful creatures! I have been to palawan a few times but have never been to a place like this..always just the typical beach resort! thanks for the informative post! very nice nature trail and quite long too ! great shots on the monkeys. Once i went for trekking with my friends, it was my first time to enter the jungle. 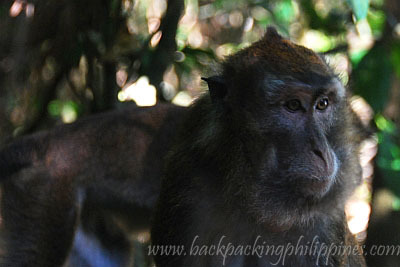 Then suddenly while walking the monkey pulled my bag and sat on the branch of a huge tree. It was very difficult for us to get the bag back. But some how we manage to get it and put on for further juorney.